This startlingly beautiful beetle, though only around 8mm long, is the apparently the absolute scourge of lily growers. Over the past couple of years I’ve noticed that as Summer turns to Autumn, our small patch of Solomon’s Seal (Polygonatum multiflorum) has looked pretty bare and it turns out that this is the culprit. 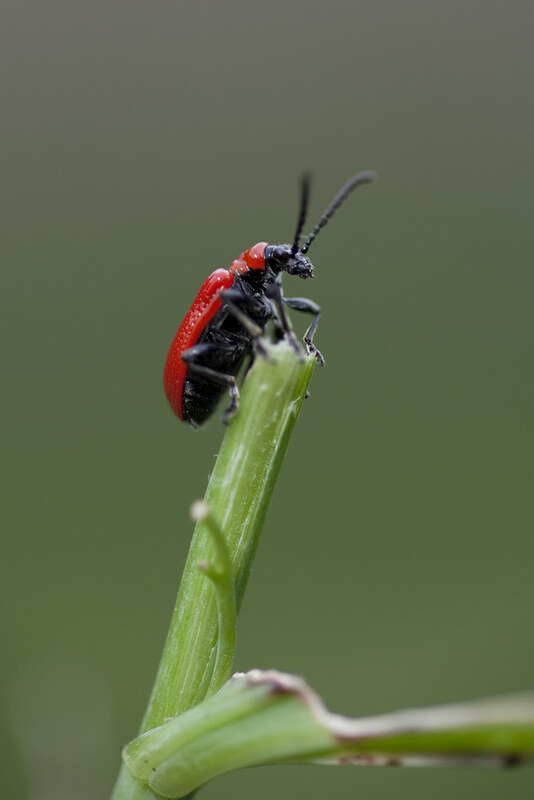 A native of Eurasia, and having a very limited range in this country before the 1930s, the beetle has rapidly spread Westwards since the 1980s and is formally considered a ‘garden pest’. It seems to me like another case of an invasive species exploiting an evolutionary niche, rather like the Harlequin Ladybird and Signal Crayfish though in this case it appears that the victims are garden plants. Indeed the RHS and National Biodiversity Network have joined forces to encourage people to record sightings of the ‘pest’ whilst the RHS gives details of the best methods of eradication. Unlike the Harlequin and Signal Crayfish, so far at least, it doesn’t appear that any native British species is at particular risk, so what singles this species out? Is it the fact that the larvae cover themselves with their own excrement to deter predation or is it simply the lily eating? Now here’s the thing: apparently the beetles are much more destructive to hybrid garden species of Lily, non-native franken-plant species themselves. So essentially, a species which is a native as nearby as the continent, is on gardeners hit lists, details of killing techniques even appearing in the Daily Mail, because it happens to eat something which looks pretty and has few natural predators. Whilst researching the last Chrysomelid, the Green Dock Beetle a few posts back, I discovered that before the 20th Century, it wasn’t found in this country either, but there’s been no witch-hunt, presumably because it feeds on plants which many consider to be ‘weeds’. Now I’m not totally unsympathetic, but I do wonder about the odd double standard at play. The moral of the story I suppose is that if you’re going to extend your geographical range, try not to exploit succulent, decorative, hitherto unexploited resources, else the ire of middle England be loosed upon your pretty carapace. Oh and try not to let your young, wear their own poo.